tableSearch(game.Table, "game.Attr. Answer 1", etc. -> Can I call an attribute in tableSearch? — Welcome to the GameSalad forum! tableSearch(game.Table, "game.Attr. Answer 1", etc. -&gt; Can I call an attribute in tableSearch? So I've been making a simple game to get me started on GameSalad and I'm starting to get the hang of the Tables and attributes, but I'm running into something that I can't seem to fix by myself. In the screenshot above, you see the tables I'm using and an overview of the rules and attributes I'm working with. As it says in the title and as you can see in the picture I added, I'm Changing Attribute: self.Attr. Row A1=Wrong to tableSearch(game.Tb. Wrong,"game.Attr. Answer 1","col",1,1,tableRowCount(game.Tb. Wrong),"exact"). self.Attr. Row A1=Wrong (which is an integer attr, the other attrs are text) should change to either 0 if the game.Attr. Answer 1 isn't in game.Tb. Wrong at all, or it'll show a rownumber which can range from 1 to 8, because it should correspond with the game.Attr. Answer 1 attribute. Thanks in advance for anyone that took the time to read this and can point me in the right direction! PS. I guess it's important to mention that I've created an instance that displays the text from game.Attr. Answer 1 and it works the way it should. It shows random words from either (also random) table Tb. Right or Tb. Wrong. PPS. I'm aware of what the Save Table function does and I got my table-copy ready to overwrite all the (saved) changes that are made between the start and end of the game. Secondly, I'll start working on Add/Remove Row stuff to make sure words don't get used twice. However, I feel that I first have to work this question out, before starting on new rules and conditions. You can use a text attribute for the search string. Ah, when using a text attribute in tableSearch, it doesn't have to be inside quotation marks. I think of attribute names as reserved words so they don't need to be in quotation marks. Also make you aren't typing in the name of the attribute... that won't work. You have to select them from the attribute browser / drop-down menu. When a word is displayed, it gets removed from the table it was in, so it doesn't show the same word in any of the other answers or further along this level of the game. Would it be better to create separate actors for the game functions or Answer 1, Answer 2, etc.? Or is it fine the way it is? Oh, and I if need a Table copy, it seems that selecting the table you wanna copy and just press Ctrl C, Ctrl V doesn't do the trick. Is there a way to select a table and create a copy of the entire table? Because in a few months, tables Right and Wrong should have hundreds of different words and I don't wanna typ every word I add to a table double for my table copy. Last question: is a table that uses over a 1000 rows, perhaps even 10.000 rows (to select a word as random as possible and you don't see the same words every time you start up the game) a good practice? Or should I spread the words over multiple tables and add code to search in multiple tables? I would typically use a single actor to create the answer rules and then copy it within a scene to make separate instances for each answer "button." You can copy a table (at least in the Mac version) during run time but otherwise, the only way is to export the table to Excel, etc. and then import a separate copy of that data. I've created a table with a boolean column. When playing the game, it sets the boolean cell to true if an answer is correct. When the game is finished, I want the player to have an option to learn from his mistakes and remake the questions (s)he answered incorrectly. 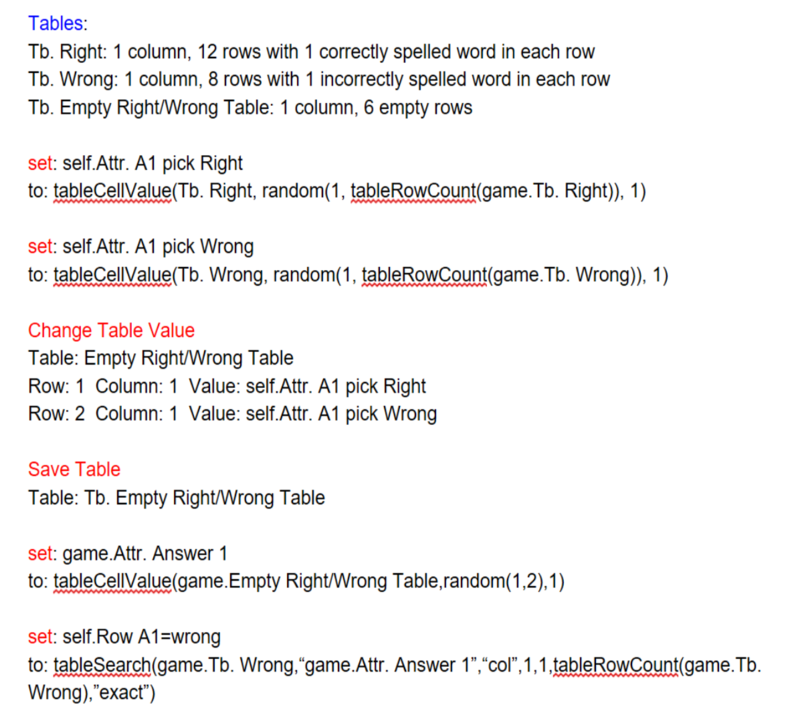 I figured it'd be the easiest way to use tableSearch to find the row in which the boolean is still false, store that value in an index-attribute rowIncorrectAnswer1 or whatever and then change the cell value of that false boolean cell to true and repeat the process, until attr.rowIncorrectAnswer turns out to be 0.
or does the zero have to be false, "false", "0" or something else. Hopefully it is actually possible, but I guess it should be. Thanks. Tested it and just 0 works, with or without quotation marks. Typing false, with or without quotation marks, doesn't. Also, I used to typ my Change Boolean Attr as true/false, until I found out you could just typ 0 and 1. Now I got 'em mixed up all over my code. I'm not too worried that I can't keep track of stuff, but I was just wondering if it matters for the engine if I use false and 0 in the same set of rules, loops, etc. Don’t think so, they’re pretty much interchangeable. No, it doesn't matter. If you prefer, you can just use an integer whenever you need a boolean. It can just as easily be 0 or 1. And you can use the expression 1-game.attribute to toggle the value since 1-0 becomes 1 and 1-1 becomes 0.